Intense Pulsed Light or IPL is a light based (laser) treatment for pigment disorders on the face and other areas. IPL stands for "Intense Pulsed Light". It is a type of laser technology that can be focused to accoplish a variety of tasks. Dawson Dermatology has special applicators for our IPL for removal of hair on light or dark skin, removal of dark spots and removal of redness in the skin. Most patients will see a 70% reduction in dark spots after one or two treatments. Redness is generally decreased by 50% after 2 to 3 treatments. IPL feels like a slight snapping of a rubber band on your skin. There is some heat, but this will be easily controlled with an ice pack during treatment. Most people tolerate treatment well after the application of a topical anesthetic (applied by our staff), though some require no numbing. If you are sensitive you can take an over-the-counter pain reliever like aspirin, Tylenol or ibuprofen. Total time in office is usally 60 to 90 minutes. Most patients will have a topical anesthetic applied for 30 to 60 minutes. The actual treatment takes 20 to 30 minutes. How often can I treat the same area? We recommend you wait 4 to 6 weeks before treating the same area again. Most people will have mild redness in the treated area that will fade by the next day. 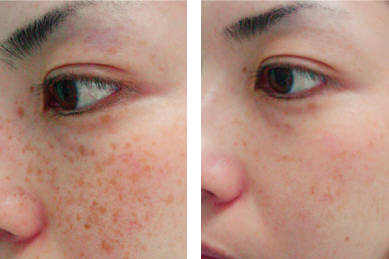 Dark spots will become more dark, and red areas will be more red for one to two weeks before gradually fading. Makeup can be applied to the area to camouflage the area until it has healed. Generalized redness or dark patches that last more than a day are uncommon - if you experience this let us know immediately so we can help you speed healing and adjust the energy for your next treatment. Treatment on the face is about $300. A package of 3 treatments is $700. We often have specials that our patients can take advantage of to make your cost even lower. Have another question? Call us or email us and we will answer your question right away!